Darpana Academy of Performing Arts, Usmanpura, Ahmedabad, India 380013. 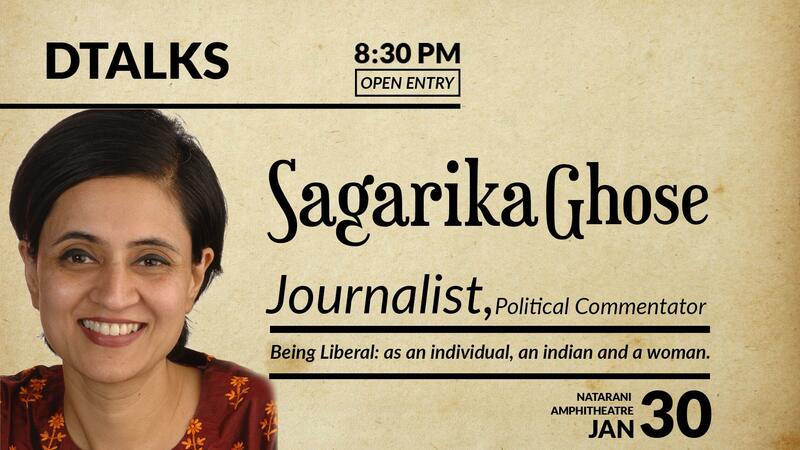 The renowned–award-winning–journalist, Sagarika Ghose will be speaking at the next DTalks at Natarani on 30 January at 8:30 PM. Sagarika Ghose is an active journalist, news anchor and author of several best-selling books. She has been a journalist since 1991 and worked with The Times of India, The Outlook and Indian Express, holding senior positions in these agencies. She was the deputy editor and prime time anchor on the news network CNN-IBN. Ghose has won several awards in journalism and is the author of two novels as well as the best selling biography of Indira Gandhi, “Indira, India’s Most Powerful Prime Minister.” Her latest novel: Why I am a Liberal deals with the idea of being a liberal in India today and forms the basis of her talk. This event is OPEN FOR ALL and the ENTRY IS FREE.